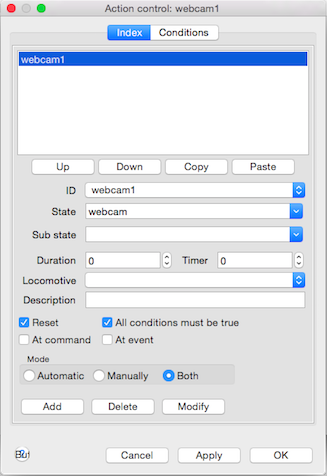 The WebCam on Server provides the captured images to all connected clients. 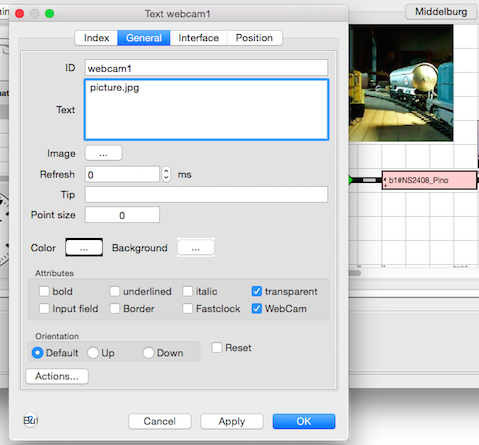 The captured WebCam image should be as small as possible to save bandwidth. This is especially important in case of connected mobile clients. 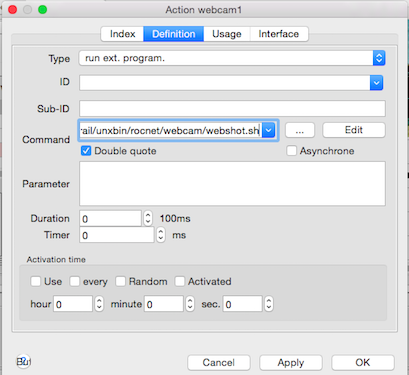 The action calls an external Capture Script for capturing a new snapshot image from the WebCam. The Asynchrone option should be disabled for this action. This action will be called every second, fixed, with the state set to "webcam". The script must provide an image in JPEG format and should be as small as possible and must be smaller then 100kB. echo "Snapping a new image of the webcam..."
echo "Snapping a new picture from $device to $picfile"
avconv -f video4linux2 -i "$device" -frames 1 "$tmpfile"